N 41° 28' 31" and E 1° 58' 54"
Castellbisbal in Barcelona (Catalonia) with it's 11,977 citizens is a place in Spain about 305 mi (or 492 km) east of Madrid, the country's capital city. Current time in Castellbisbal is now 11:24 AM (Friday). The local timezone is named Europe / Madrid with an UTC offset of 2 hours. We know of 9 airports near Castellbisbal, of which 3 are larger airports. The closest airport in Spain is Sabadell Airport in a distance of 7 mi (or 11 km), North-East. Besides the airports, there are other travel options available (check left side). There are several Unesco world heritage sites nearby. The closest heritage site in Spain is Works of Antoni Gaudí in a distance of 10 mi (or 16 km), South-East. We encountered 10 points of interest in the vicinity of this place. If you need a hotel, we compiled a list of available hotels close to the map centre further down the page. While being here, you might want to pay a visit to some of the following locations: Martorell, Palleja, Rubi, Viladecavalls and Cervello. To further explore this place, just scroll down and browse the available info. Let's start with some photos from the area. Moderate rain, fresh breeze, overcast clouds. 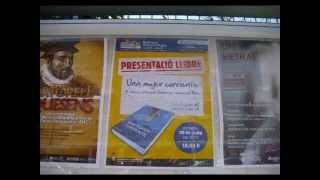 ENTREVISTA EN RADIO MARTORELL A ARACELI GUTIERREZ SOBRE SU NUEVA NOVELA "UNA MUJER CORRIENTE" 28-MAYO 2012. 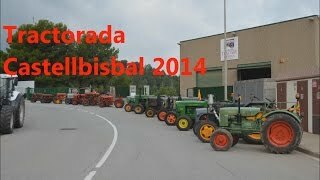 Desfile de tractores organizado por el Museu del tractor d'Època para las fiestas de Castellbisbal 2014. 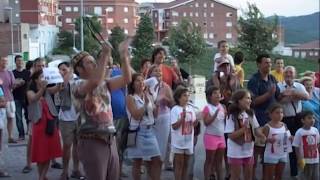 Fiestas Mayores de Castellbisbal grabadas en Agosto del 2004, por la celebración de los 25 años de la Cuca. 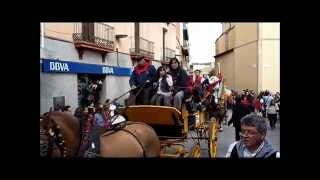 Festa de Sant Antoni Abat - Els Tres Tombs. Actuació de la Banda de Col·legi Pare Manyanet a Castellbisbal, Barcelona el diumenge 1 de març de 2015. 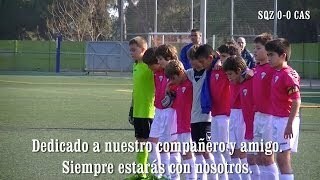 19ª Jornada [3-2] Sant Quirze - UE Castellbisbal ALEVIN Mejor Equipazo 2014. Located at 41.5639, 2.03972 (Lat. / Lng. ), about 7 miles away. Castellví de Rosanes is a municipality in the comarca of the Baix Llobregat in the province of Barcelona, Catalonia, Spain. The municipality had 1.370 inhabitants as of 2005 and has 17,09 square kilometers, in which are settled the population areas named as Els Àngels, Can Sunyer del Palau, Miralles, El Taió and Valldaina. Located at 41.4517, 1.90056 (Lat. / Lng. ), about 5 miles away. Located at 41.5, 1.96667 (Lat. / Lng. ), about 2 miles away. Located at 41.5611, 2.00806 (Lat. / Lng. ), about 6 miles away. The Pont del Diable (Spanish: Puente del Diablo, English: Devil's bridge) is a medieval bridge crossing the river Llobregat in Martorell-Castellbisbal, Catalonia, Spain. The present bridge, featuring a large pointed arch, was constructed in 1283 on Roman foundations. The main clear span is an impressive 37.3 m with a stone chapel on top. A secondary arch has a span of 19.1 m.
Located at 41.475, 1.938 (Lat. / Lng. ), about 2 miles away. Located at 41.5014, 2.09111 (Lat. / Lng. ), about 6 miles away. Located at 41.5761, 2.01114 (Lat. / Lng. ), about 7 miles away. Located at 41.5642, 2.0225 (Lat. / Lng. ), about 6 miles away. Located at 41.4736, 2.085 (Lat. / Lng. ), about 5 miles away. Ullastrell is a village in the province of Barcelona and autonomous community of Catalonia, Spain. 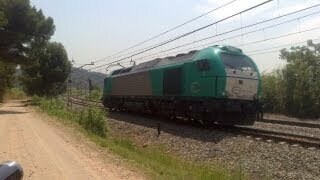 The municipality covers an area of 1.904 square kilometres and as of 2011 had a population of 722 people. Located at 41.5333, 1.95 (Lat. / Lng. ), about 4 miles away. Located at 41.45, 2.06667 (Lat. / Lng. ), about 5 miles away. Located at 41.4447, 2.07306 (Lat. / Lng. ), about 5 miles away. Located at 41.4679, 2.07836 (Lat. / Lng. ), about 5 miles away. Located at 41.4578, 2.06826 (Lat. / Lng. ), about 5 miles away. The L’Enrajolada Santacana House-Museum (in Martorell, is one of the oldest museums in Catalonia. 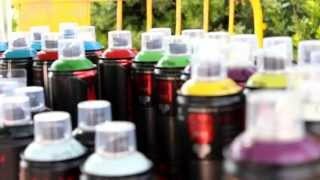 It was founded in 1876 by Francesc Santacana i Campmany and then taken over by his grandson, Francesc Santacana i Romeu . It is located in an old private residence with four floors and a garden, which belonged to the Santacana family. L'Enrajolada is part of the Barcelona Provincial Council Local Museum Network. Located at 41.4743, 1.92883 (Lat. / Lng. ), about 3 miles away. The Vicenç Ros Municipal Museum, in Martorell, occupies one of the sections of an old Capuchin convent dating back to the 17th century and is part of Barcelona Provincial Council Local Museum Network. Opened in 1945, the museum came to be thanks to Vicenç Ros i Batllevell (1883–1970), who donated his large ceramics collection. Over the years, the museum has organised its collection into different categories, which it has expanded: ethnology, art, archaeology, architecture and archives. Located at 41.4731, 1.93161 (Lat. / Lng. ), about 3 miles away. Located at 41.4945, 2.02647 (Lat. / Lng. ), about 3 miles away. Located at 41.4744, 2.0853 (Lat. / Lng. ), about 5 miles away. Located at 41.5653, 2.01944 (Lat. / Lng. ), about 7 miles away. Located at 41.5622, 2.01167 (Lat. / Lng. ), about 6 miles away. These are some bigger and more relevant cities in the wider vivinity of Castellbisbal.